Browse our collectible finds in Mosser Glass tableware in jade green milk glass and hunter green at Distinctive Decor. The handcrafted covered turkey bowls created in hunter green or classic jadeite glass by Mosser Glass are two-piece sets with raised-pattern turkey-shaped lids and bowls that looks like nests. This bowl with lid is 7 inches wide, 8.5 inches long and 7 inches high. We also have the miniature version of this popular Mosser Glass keepsake. 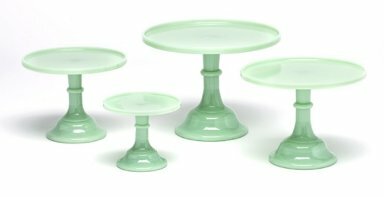 We have three-piece nesting jadeite glass mixing bowls by Mosser Glass, as well as green dinner service plates, salt and pepper sets, tumblers, goblets, footed cake plates and artfully crafted candlesticks. Trust our expertise at American-owned Distinctive Decor to assist you in starting or building your Mosser Glass collection.